The bigger the dog, the more he eats. That cuddly pooch of yours isn't so sweet when his tummy is rumbling. It seems like just yesterday you bought dog food, but it's already time to buy some more. Buying larger bags from wholesale distributors gives you more time between emergency grocery store trips and can save you money. Calculate how much your dog eats in a day—let's say 2 cups of dry food. 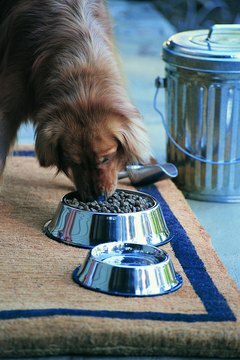 There's an estimated 4 cups of dry food per pound in each bag, so your dog goes through about a pound of food in two days. Determine how many pounds your dog can eat in six weeks, which is about how long an opened bag of dog food can stay fresh when stored in an airtight container. If he eats half a pound per day, he can eat 21 pounds of food in six weeks. This is the most any bag you buy should contain. Pick a wholesale club to join. Most national clubs, such as Sam's, BJ's and Costco, offer one-day passes to let you check out their merchandise and prices. Compare their annual fees, benefits, prices and other policies, such as whether they accept coupons, to determine which is the best fit for you. Make sure the club you choose carries the dog food brand you plan to buy; clubs often limit their selection to a few brands and flavors. Fill out the membership form to join the wholesale club. Complete the membership application by paying the annual fee and taking a photo to add to your membership card. Shop for bulk bags of dry dog food or packs of canned food. Look for smaller bags of dry food shrink-wrapped together as a bulk item, rather than overly large bags that will take your dog longer than six weeks to eat. Similarly, shop for smaller cans of food in higher quantities sold together rather than larger cans; when covered and refrigerated, canned dog food can last two to three days. Choose cans that your dog can finish in that length of time. Store canned food indoors in a cool location, such as a closet. Avoid areas without heat and air, such as garages, that might experience harsh temperature fluctuations. Store dry food in an airtight container. Wash the container with dishwashing liquid and let it dry completely. Open the bag of dog food, then roll up the top and place the entire bag in the container. The bag is designed to keep out moisture and extend the life of the food, so it's helpful to keep the food in the bag. Also, the bag has all the manufacturer's information for you to refer back to when checking expiration dates or when dog food is recalled. If you own your own business that has a state sales tax number, you might be eligible to buy directly from wholesale distributors. Some allow you to purchase dog food only if you're in the industry, such as if you're a breeder or run a kennel, while others ask only for proof of your retail license. Consider your pooch's age when buying wholesale food in bulk. If your dog is transitioning from puppyhood to being a grown-up, don't waste money buying six months' worth of puppy food, for example.